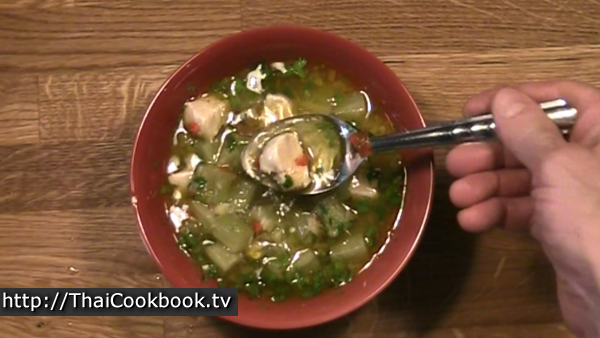 This easy to make chicken soup with bitter melon has the most amazing flavor. 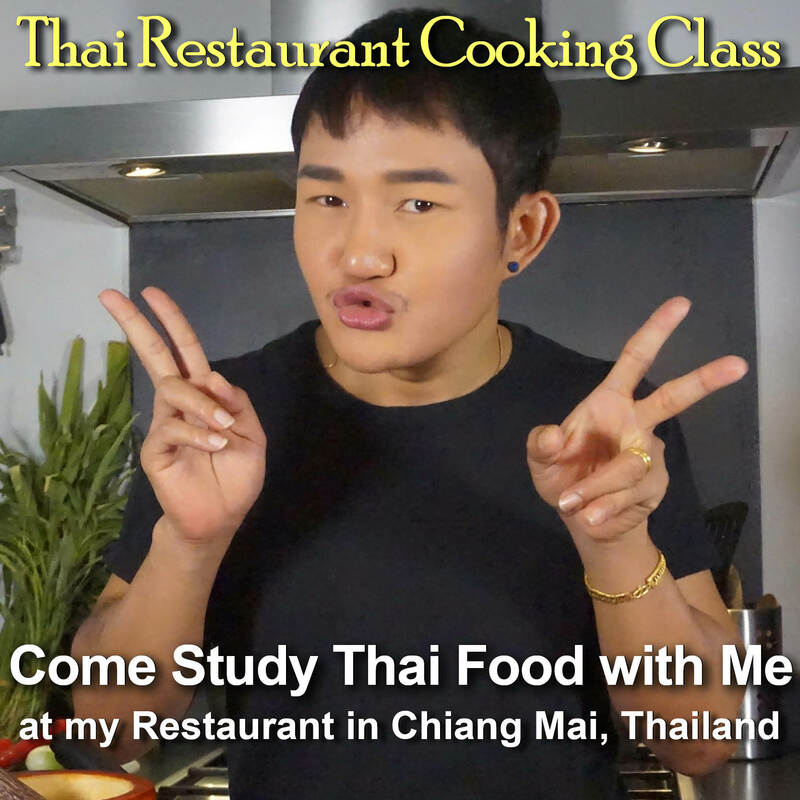 The ingredients are usually quite easy to obtain and it just takes about 15 minutes to prepare as a delicious lunch or part of a family style meal. 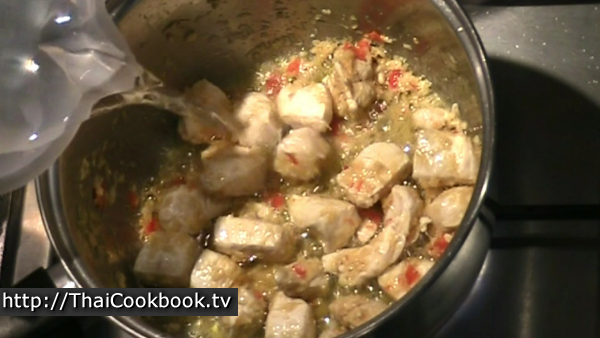 We start with chunky chicken breast, and cook it in an herbal base made with lemongrass, coriander, galangal, garlic, and a little hot chili. These are then cooked into a soup along with Chinese bitter gourd. The combination of herbs mellows the bitterness of the gourd considerably as they cook together. 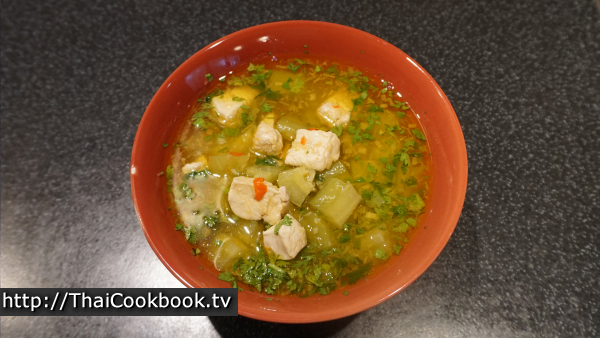 The result is a delicious and hearty bowl of chicken soup like no other. It's one of our favorites. What's in our Herbal Chicken Soup with Bitter Melon. 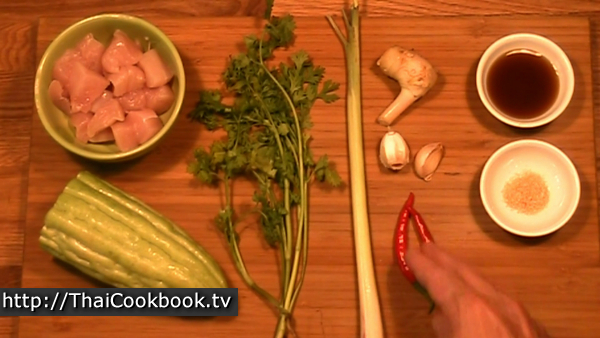 How we make our Herbal Chicken Soup with Bitter Melon. 1) Cut the chicken into small cubes. Cut the bitter melon, remove the seeds and inner pulp, then cut it into bite-sized pieces. 2) Chop the coriander sprigs and leaves. Grind the galangal, garlic, and red chili together, into a rough pulp. 3) Fry the herbs in coconut oil for about 30 seconds, then add the chicken and fry slowly until cooked. Add water and bring to a boil. 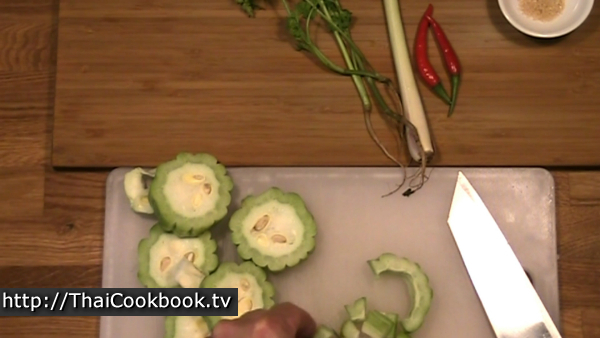 4) Add the cut bitter melon and cook for 8 minutes, or until tender. turn off the heat and add chopped coriander leaves. Serve while hot, sprinkle with additional chopped coriander just before serving. 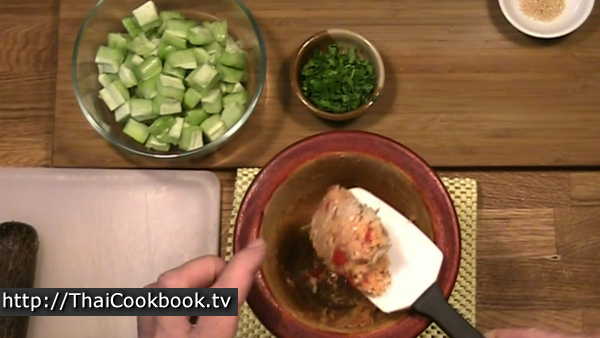 Remove the skin from 1/2 an average sized chicken breast, and cut the meat into 1/2 inch cubes. Cut one Ma Ra melon in half, save one half for something else. You'll also need 3 - 4 good-sized coriander plants with the roots still attached, a small piece of galangal, and 2 - 3 cloves of garlic. 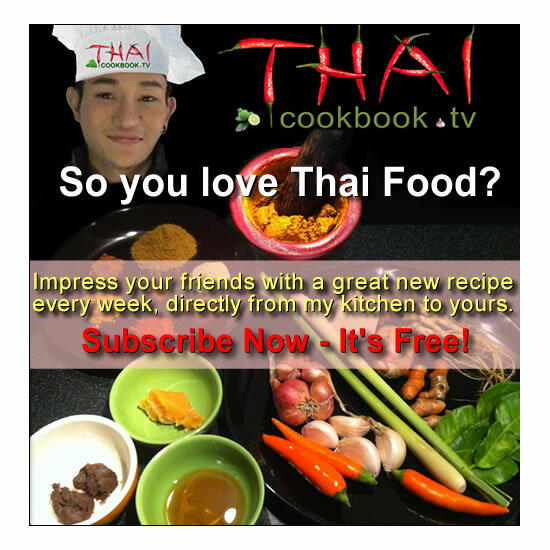 I use 2 - 3 Thai hot chilies, but they are optional if you do not like spicy soups. 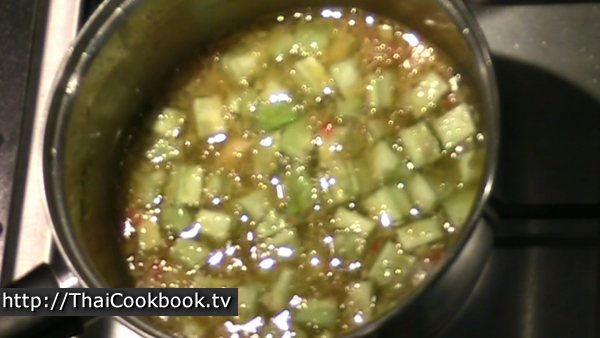 You can also use a mild red chili, as the color from either hot or mild contrasts nicely with the yellow-green soup. We also add a little sugar and soy sauce. Slice the melon across into about 1 inch slices, then remove the inner core and seeds and discard them. Cut the outer part into small bite-sized pieces. 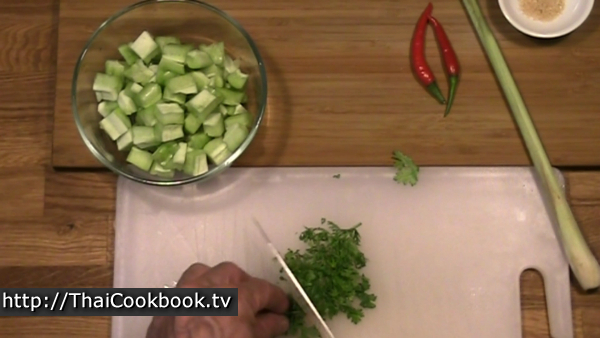 Chop the coriander stems and leaves very fine, until you get about 2 tablespoons of the chopped herb. Cut 3 slices of galangal off the main root and then cut them into very small pieces. Also peel the garlic. 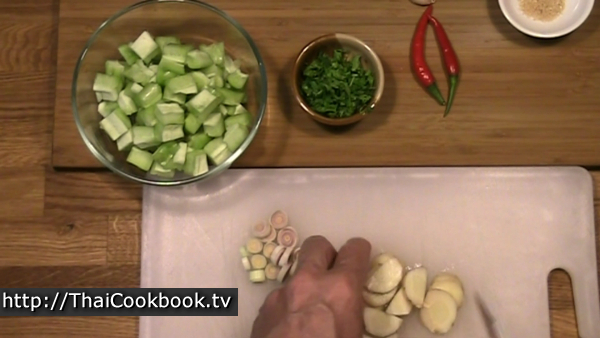 Using a mortar and pestle, grind the galangal until it is a rough pulp, then add the garlic and chilies. Grind everything together until no large chunks remain, and it is well blended. Using a medium sauce pan or soup pot over low heat, add 1 Tablespoon of coconut oil, let it get barely hot, then add the herb and chili mixture. Fry it off until it is nearly cooked. Keep the heat low and cook for longer, as you do not want it to burn and spoil the flavor. Next add the chunks of chicken to the pot and stir it into the oily herbs. Fry until the chicken is nearly done, which should take only about 2 minutes or so. Next add 2 cups of water to the pot and stir everything well. Add the soy sauce and sugar. Heat over medium heat until it start to boil. Now add the cut melon to the soup and bring it back to a hard boil. 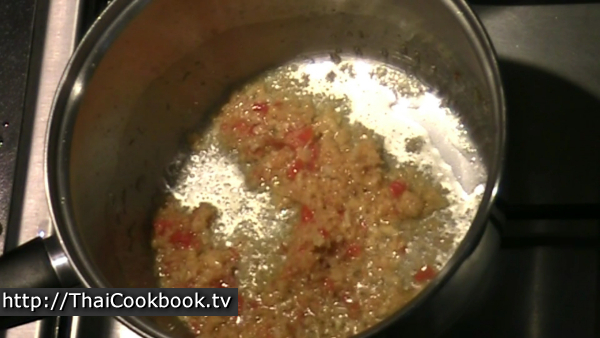 Reduce the heat until it is barely boiling and cook like that for about 7 - 8 minutes. Stir often and check the melon. When it starts to become tender and you can cut it with a fork it is usually done. However, you should also taste it. As the melon cooks it will become less bitter, so if it is still hard and very bitter, just keep cooking for a while longer. Turn off the heat and check the flavor one last time, and decide if it has enough salt. You can add a little more soy sauce or just a small pinch of salt if you think it needs it. When you are satisfied, stir in about half of the chopped coriander, saving the remainder for a garnish. I like to use one bowl to be shared at the table for 2 - 4 people with rice and other foods, but this could also be one very hearty bowl of soup for one, served alone. 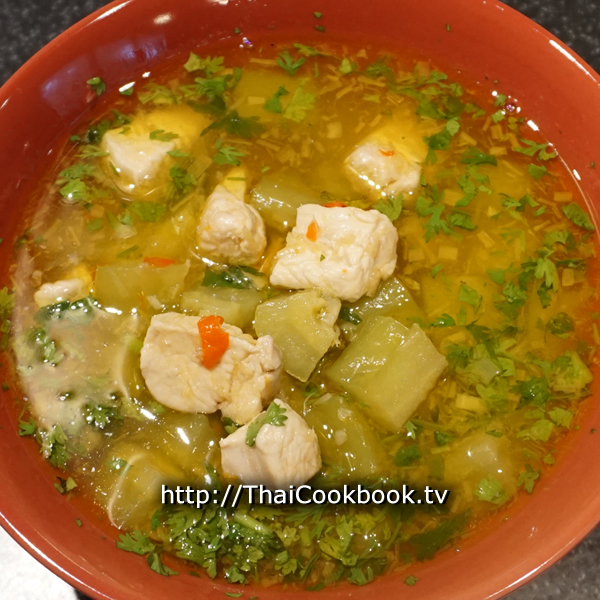 Stir the soup so it has some nice chicken and melon chunks on top. Sprinkle the top with the remaining chopped coriander. 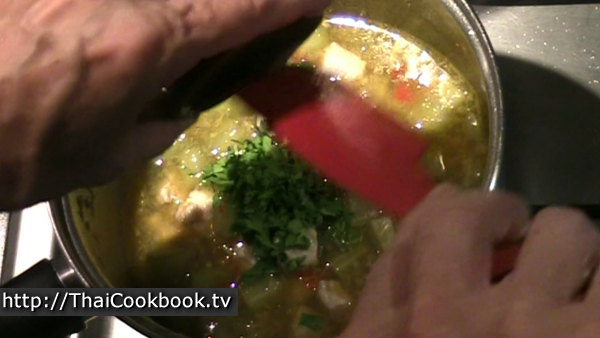 No other garnish is really needed, ans this soup has a rich green ans yellow color with little red flecks. It's delicious, I hope you try it.